William A. Zoghbi, a renowned cardiology, echocardiography and cardiac imaging expert, has developed noninvasive heart function and valve disorder evaluation techniques. As a result, Dr. Zoghbi has overseen national and international heart valve evaluation guideline development. He built his reputation on his ischemic heart disease, myocardial function and hibernation research, as well as his development of echocardiographic techniques to evaluate valvular dynamics and measure valvular regurgitation. Dr. Zoghbi has authored more than 300 publications and lectured at every major cardiology conference worldwide. A dedicated educator, Dr. Zoghbi has trained more than 100 cardiology fellows in advanced cardiovascular imaging. In 2004, he received the American Society of Echocardiography’s Richard Popp Excellence in Teaching Award. He also co-chaired the American College of Cardiology committee responsible for a monograph advising cardiovascular imaging training best practices. 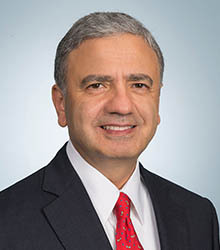 In 2005, Dr. Zoghbi joined the Houston Methodist Specialty Physician Group following his 20-year tenure at Baylor College of Medicine, where he was the John S. Dunn Professor of Medicine and served as Houston Methodist’s echocardiography laboratory director. In 2005, he established Houston Methodist’s Cardiovascular Imaging Institute, integrating all cardiovascular imaging modalities to enhance patient care, education and research. He became the William L. Winters Endowed Chair in Cardiovascular Imaging in 2005. In 2016, Dr. Zoghbi was appointed chairman of the Department of Cardiology at Houston Methodist and holds the Elkins Family Distinguished Chair in Cardiology, established in his honor. Dr. Zoghbi´s research focuses on cardiovascular imaging, emphasizing echocardiography. He has developed methods for evaluation of valvular function, ventricular function quantitation and myocardial viability detection in patients with ischemic ventricular dysfunction. More recently, Dr. Zoghbi has collaborated with University of Houston mathematicians and led his laboratory’s efforts to better understand cardiac valve structure and function and improve quantitation of artificial valve function using in vitro modeling and multimodality imaging.